Graffiti artists are able to use the walls of cities to make political and social comments so they can express their opinions. Many will argue it is an illegal form of expression because the canvas is the side of buildings. However, for many of those who use graffiti as a means of expression its the only way that their opinions can be heard because they are not treated as equal participants in society. 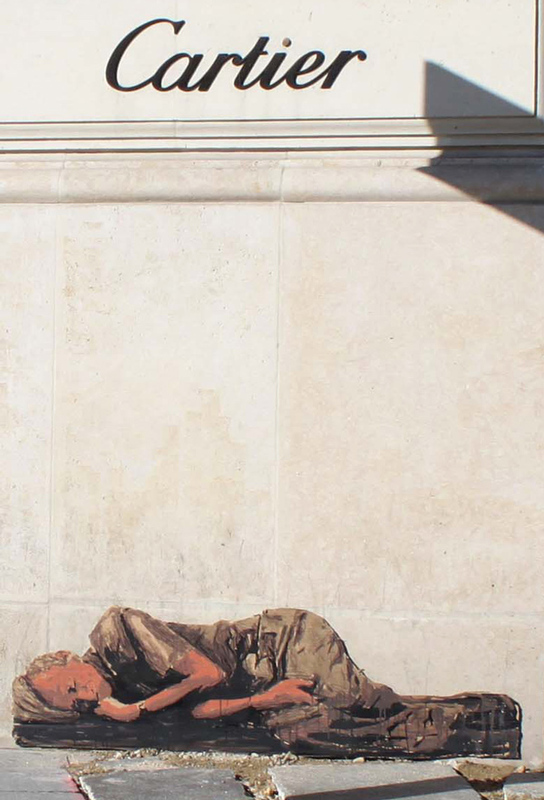 The artist Michael Aaron Williams drew on a wall and provided a picture of a homeless person lying on the street. The ironic part of the picture is that its on the side of the Cartier Building, a luxury watch and jewelry retailer in Paris, France. The artist in this particular picture is trying to illustrate the complexity that exists with a society that can sell expensive timepieces but cannot provide employment and affordable housing for its citizens. The artist of this particular painting is Koolhats and it is a picture of the US President but his face is several different colors to express that the President is a not of one race but many. Then there is a quotation from the US President which states “ I’m asking you not to believe in my ability to bring about real change in Washington. 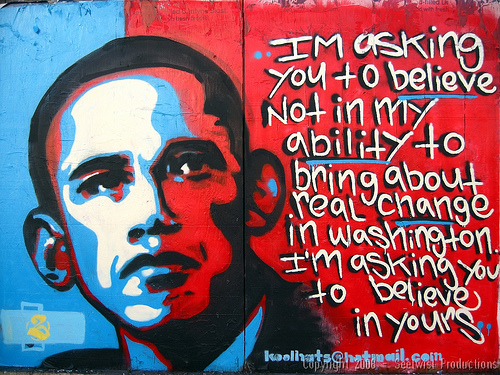 I’m asking you to believe in yours.” He wants the people of the United States to believe in their ability to create change and this is what Koolhats is trying to convey to the people in the Santa Fe Art District. This wall painting is a message to everyone about the motivations of British and US government. The great thing about art is that it creates conversation and some will argue that its refers to when conversation between two sides fails how one side will use military might to gain control of another country and how kids have now come to accept this as the way things occur in the world. This graffiti art is a picture of a homeless person sitting on the street with a cardboard which says “Keep Your Coins, I Want Change.” The power of this on the wall of building is that it causes people to think about what is being done to change not just the situation of homelessness in the United States but also the problems of unemployment. People don’t want others to give them money, they want a change in the system so that they can earn their own money. This artist used this drawing as part of a university assignment and thus it makes one wonder how much impact it has had on others because it does not seem like he is the creator of this particular graffiti art but came across it during his travels and decided to show it on the Internet. If it impacted a university student to such an extent that he felt the need to use it for a school assignment imagine how it resonates with the people who walk by it on the street on a daily basis. Diego Sanchez is part of TorontoMuralists.ca, Toronto Muralists providing custom painting services. He also likes to blog about what's happening around the world and turn them into meaning arts.